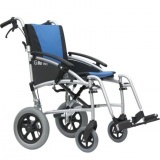 The Excel G-Logic Self Propelled Wheelchair a compact lightweight wheelchair with an attractive silver frame. The Excel G Logic Transit Wheelchair 16" slim seat with an attractive red upholstery and white frame. 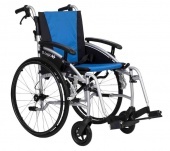 Choosing a Wheelchair is simple with our range of Lightweight Wheelchairs. 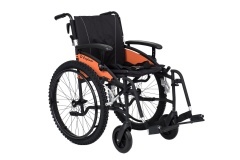 Whether you require a "Self Propelled Wheelchair" with larger rear wheels allowing the user to push and propel themselves or if you require a "Transit Style Wheelchair" with Smaller rear wheels we have a wide selection of both and all are Lightweight. Whether you require a wheelchair in a certain colour or a different seat width ( 18" - 45cms being the Standard) we can help you. Delivery within a matter of days on all our Lightweight Wheelchairs.